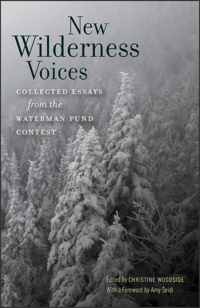 New Wilderness Voices: Collected Essays from the Waterman Fund Contest, edited by Christine Woodside, 2017. This collection of 20 essays from the annual Waterman Fund Contest celebrates and explores wilderness, wildness, and our connections to the wild both without and within. There is some beautiful writing here. 200 pp., 5 1/2" x 8 1/2."